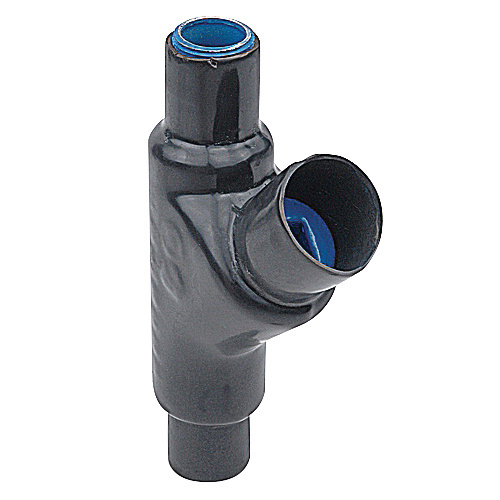 Thomas & Betts Ocal-Blue® Double-coated conduit sealing fitting in gray color, features ductile iron construction and PVC coated finish. Fitting with female connection, has a trade size of 1/2-Inch, bend radius 1.09-inches and length of 3.63-inches. Insulation of conductors are protected by integrated bushing, easy packing of sealing materials through the large access opening and minimum of five threads are provided in all hubs of this fitting. It is ideal for applications to resists the gas passages, vapors and flames at atmospheric pressure and normal temperature. Fitting is UL listed and CSA certified.